Every player in goalunited has the ability to learn a specific talent. When a player is created it is set which kind of talent the player can develop, but it up to the manager to find and promote it. You can see your player's talents in your player list, each talent has a specific icon indicating what it does. The quality of a talent is measured by the number of talent slots a player has. A player can have up to 5 talent slots for his talent (indicated by 5 icons in the list). Each slot that is added for a player starts out 'empty'. The talent then has to be trained so that the slots fill up. The more fully trained talent slots a player has, the better. Talents do not only help your team during the matches, they also raise the sales value of the players. Players with good talents are always in high demand on the transfer market. Some of those talents are triggered in the background, they affect the results of the matches, but they are not displayed in the live ticker. Other talents are triggered quite obviously. The talents lead to actions in the match that are clearly recognisable in the live ticker. The actions are coloured green and show the talent. The more talents slots are filled, the better. For talents that trigger actions during the matches, the possibility for the an event goes up. For talents that add a bonus, the bonus increases. To add a talent slot go to the player list and hit the 'Play card' button on the bottom right. On the opening screen you can then play a 'Talent slot' trading card. A new and empty talent slot is added instantly. For players without a talent the first slot reveals which talent the player is 'born with'. There are three different cards, the card shown adds the first or second slot for a player. The next best card can also add slots three and four, and the best of the three can be used to add any of the 5 slots. To fill a talent slot and with that make the talent active, you have to train it. You can do that by either selecting the 'talent training' for your general training, or by playing an 'improve talent' trading card. Both of those methods slowly fill up the slot until it reaches 100%. The first talent slots fills up very quickly, as only very few training points are needed. Each additional slot requires more training points to fill up. Be aware though: Talent training either by card or by training program only affects one player at a time! Talent training only takes effect if a player has a talent slot that is not fully trained. 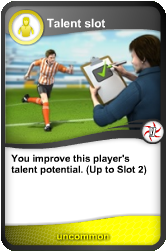 If the player has no talent slots at all or all slots are fully trained, a new talent slot has to be added first. Talent slot improvement is possible also if you achieve victory in a match against Top Team "Stars of London", talent of one of your players will be improved (possible up to 30 times per season).